Action of the bendy kind was unchained in Canberra this week with the arrival of a brand new bendy bus, the first articulated bus entering service in almost 20 years, and built by Custom Coaches in Adelaide on a Scania chassis. While Canberra has other bendies in action at the government-run Action Buses, they are fading fast after decades in service, which led the ACT Government to commission upgrades. ACT Chief Minister Katy Gallagher officially ‘welcomed’ the new accessible, articulated, large-capacity bus. "It is great to see the first new articulated bus in Canberra in nearly 20 years now entering service and I have no doubt it will be a valuable addition to the Action fleet," Gallagher says. "Between now and March 2013, twenty easy-access articulated buses will be progressively delivered replacing Action’s ageing articulated fleet, some of which are now up to 24 years old." Gallagher says the new buses will assist in meeting demand on Action’s most highly patronised routes, such as the Blue and Red Rapid services, while also providing school transport where high capacity buses are needed. "I also hope they help to make public transport a more attractive alternative to driving for Canberrans," she says. A team of ACTION fleet representatives, together with driver and workshop representatives, performed a pre-production test of the buses last year to finalise specifications. The buses carry up to 107 passengers with 65 seated, fully accessible, climate controlled, low emission and meet Environmentally Enhance Vehicle (EEV) emission standards. Since the bus replacement program began in January 2004, 191 new buses have been added to Action’s fleet, replacing older non-DDA compliant buses. The 20 new articulated buses have been funded as part of the $75 million allocated in and since the 2008-2009 ACT budget. 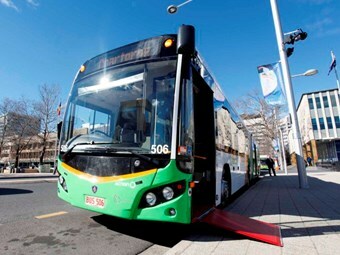 The 2012-2013 ACT budget provides a further $48.527 million to replace 90 buses over the next five financial years. "These replacements will be part of the ACT Government's commitment to achieving an accessible fleet target of 55 percent by December 2012 to meet the Disability Discrimination Act 1992 (DDA)," says Gallagher.